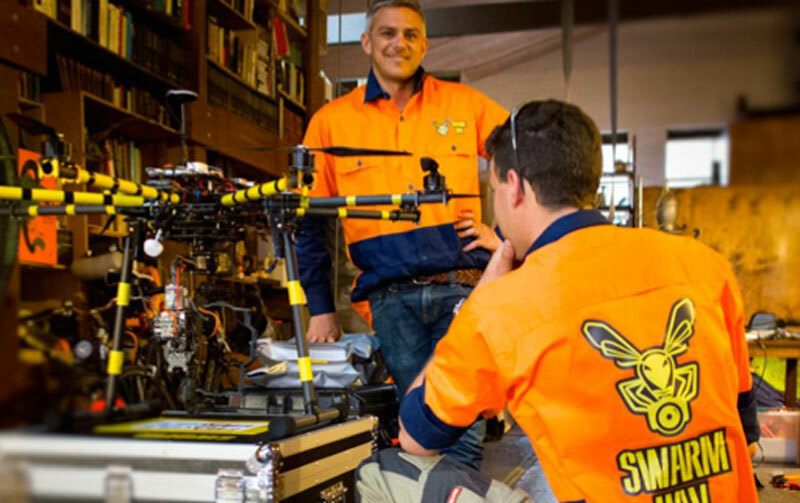 Australia-based aerial filming company SWARM UAV works on a multirotor. Companies that use RPAS in Australia are looking at developing and using smaller and lighter aircraft, which would allow more regulatory freedom to operate. Photo courtesy of Ryan Hamlet, PSDJ board member and RPAS operator for SWARM UAV. As Australia’s air authority considers relaxing regulations for small drones, experts there are optimistic about the future for drone journalism. In June, the Civil Aviation Safety Authority (CASA) announced proposed rules for small remotely piloted aircraft systems (RPAS) that would create a new class of “low-risk” aircraft that requires no special certification. RPAS that weigh under 2 kilograms (4.4 pounds) would be operable by individuals who do have a Remote Pilot (RP) certificate or Unmanned Aircraft System Operator’s Certificate (UOC). For comparison, a loaded DJI Phantom 2 quadrotor, a popular small RPAS among amateur and professional aerial photographers, weighs just over 1 kilo. Hexcopters typically weigh at least 3 kilos, as weight increases along with the sophistication of the vehicle and its camera or sensor package. RPAS developers and operators in Australia have described new efforts in designing sub-2 kilogram aircraft that would allow more freedom to operate. And drone journalism researchers and news agencies are now exploring new possibilities. Mark Corcoran, who leads an effort to integrate RPAS into reporting at the Australian Broadcasting Corporation (ABC), sees more media organizations being able to pick up and use the technology. Corcoran, who has previous experience reporting from war zones, is the co-author of a Reuters Journalism Institute paper on drone journalism. He’s also the author of the report “Drone Journalism: Newsgathering applications of Unmanned Aerial Vehicles (UAVs) in covering conflict, civil unrest and disaster,” and a member of the PSDJ. The lower barrier-to-entry will benefit news agencies by reducing paperwork, and will allow journalists to loft small GoPro-type action cameras around news events, according to Ryan Hamlet, PSDJ board member. Even with those obstacles removed, it still won’t be open season for drone journalism. Low-risk RPAs are still subject to some regulations in Australia. Sup-two-kilogram RPAS must not be flown within 5.5 kilometres of an airport, or at night, or within 30 meters of people, or directly over the top of populated areas. Flights are strictly within visual line of sight, and the RPAS must not fly above 121 meters. “The ’30 metres from people or building’ rule will continue to frustrate journalists that need that close up shot, but establishing shots, natural disaster coverage, farm and drought stories, etc just got a lot easier,” Hamlet noted on the SWARM UAV blog.